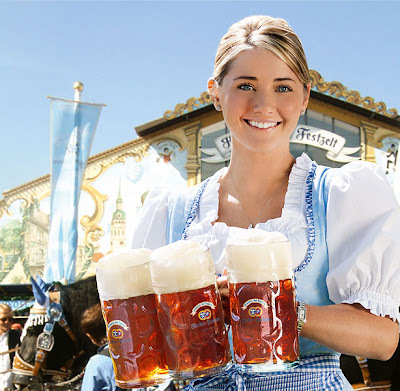 From the union of marriage sprang one of the oldest and largest beer celebrations in the world that is known as Oktoberfest. Here is a little history lesson about how it came to be. As the closing event to the wedding celebration, the Royal Family hosted horse races, and that was what ultimately kept the tradition of Oktoberfest alive. The next year, as an added feature to the horse races, there was an Agricultural Show, meant to boost and highlight Bavaria’s rich agricultural heritage. By 1818, the first carousel was added to the event. 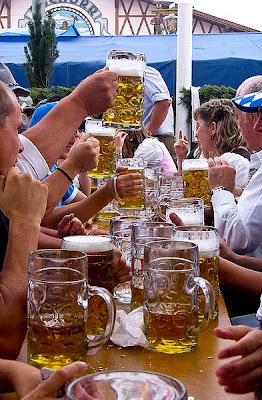 And to cater to the thirsty crowds, small beer stands started popping up. In 1896, the beer stands were replaced by large beer tents and beer halls set up by rich, enterprising landlords in conjunction with the local breweries. Although the horse races are no longer part of the celebration, ended in 1960, an Agricultural Show is still held every third Oktoberfest on the southern edge of the festival grounds. The carnival aspect continued to grow over the decades, and today you will find carousels, roller coasters, and other fun carnival games at Oktoberfest. The traditional foods served include Hendl (chicken), Schweinebraten (roast pork), Schweinshaxe (grilled ham hock), Steckerlfisch (grilled fish on a stick), Würstl (sausages) along with Brezeln (pretzel), Knödel (potato or bread dumplings), Käsespätzle (cheese noodles), Reiberdatschi (potato pancakes), Sauerkraut or Rotkohl/Blaukraut (red cabbage) along with such Bavarian delicacies as Obatzda (a spiced cheese-butter spread) and Weisswurst (a white sausage). The official festival runs 16 days, from the third weekend in September through the first weekend in October. By any standard, Oktoberfest is the largest festival in the world, drawing now more than six million visitors each year. Thanks for the history lesson. I had always been under the impression that it was to celebrate the harvest.